This term P1M have been doing the topic fairyland. A friendly dragon has been writing to us and we are helping him get Fairyland back. Not enough boys and girls are reading fairytales anymore and his home has started to disappear! 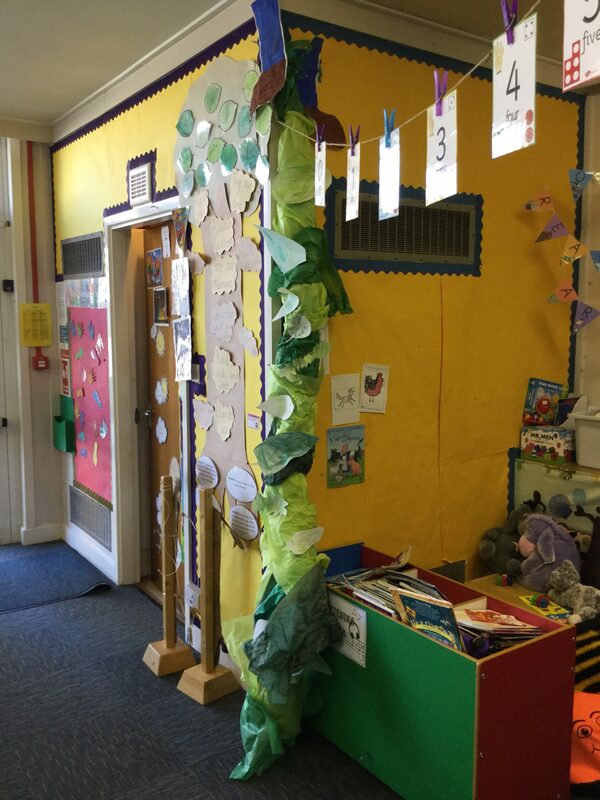 Everyone has been working very hard to help turn our classroom into fairyland, so far we have a beanstalk, a castle and a dragon. 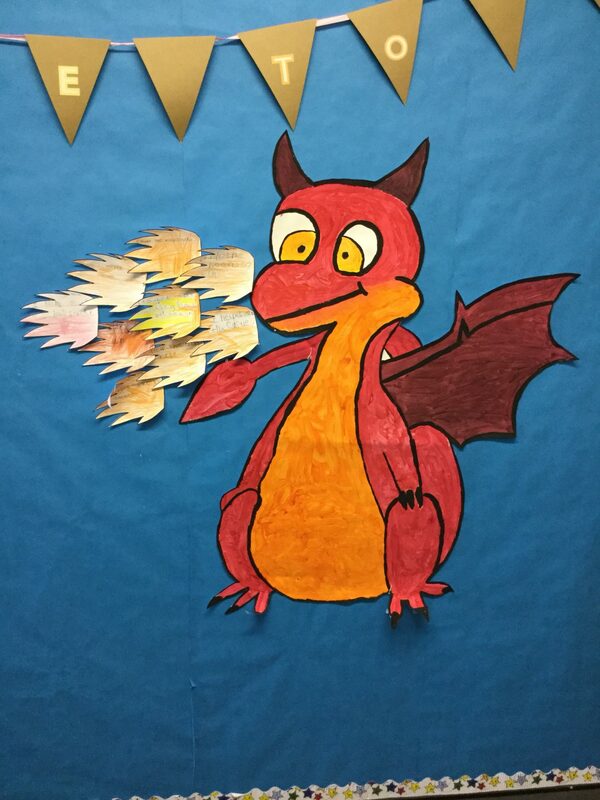 Everyday we check the classroom to see if the dragon has left us another letter, sometimes he even leaves us a story! 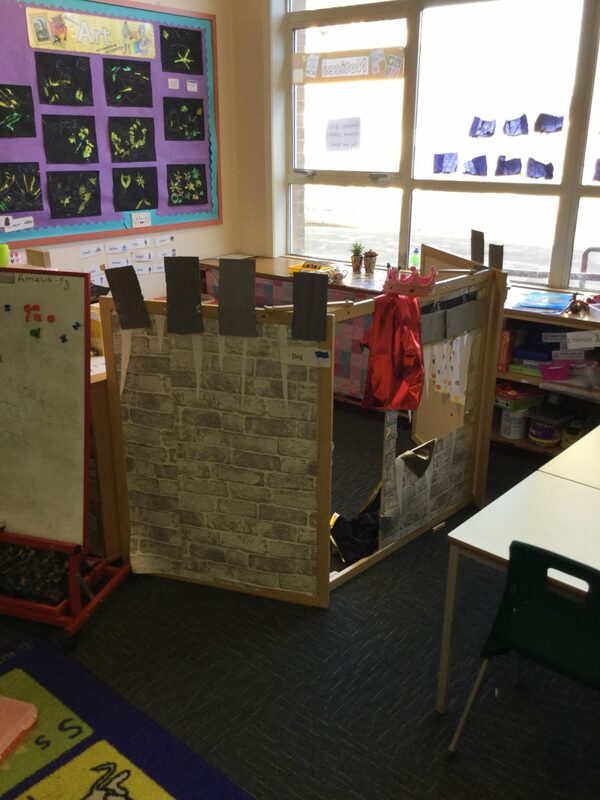 When we have finished turning our classroom into Fairyland we are going to invite our families in to see all our hard work! 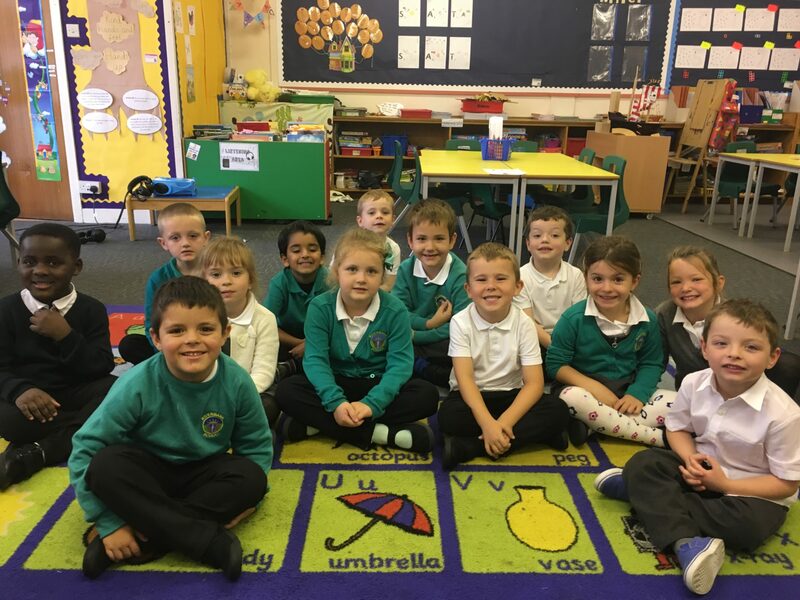 Welcome to P1M’s class blog! Now that everyone is settled in to P1 I thought it was about time to update the blog. 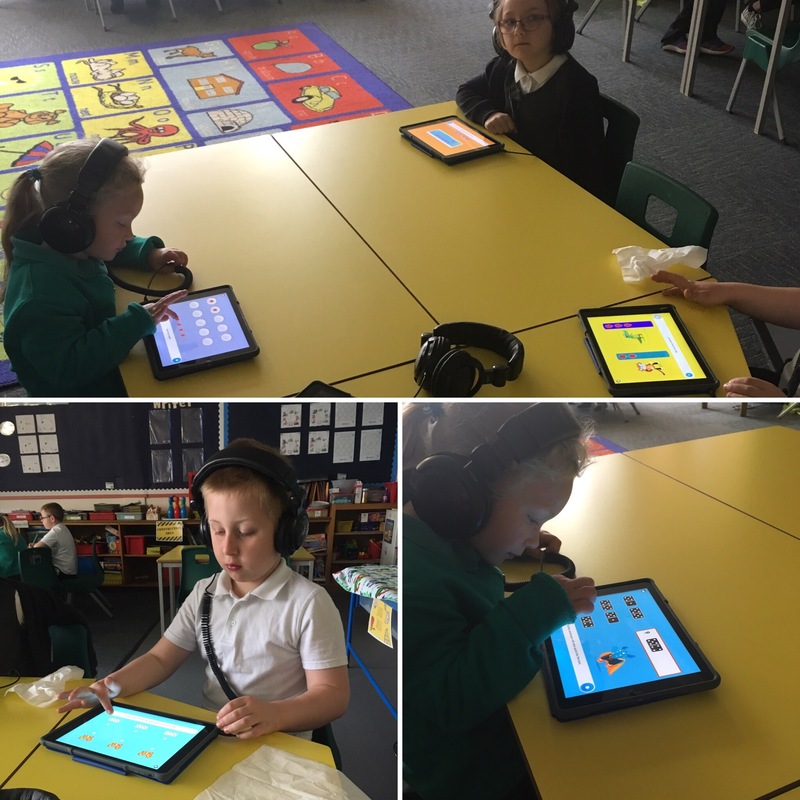 Over the last few weeks we have been learning our numbers to 10 and learning our first few sounds. They have all been working so hard and I’m very proud of the progress they are making! Next week we will be taking part in a sharing assembly. We hope you can come along! 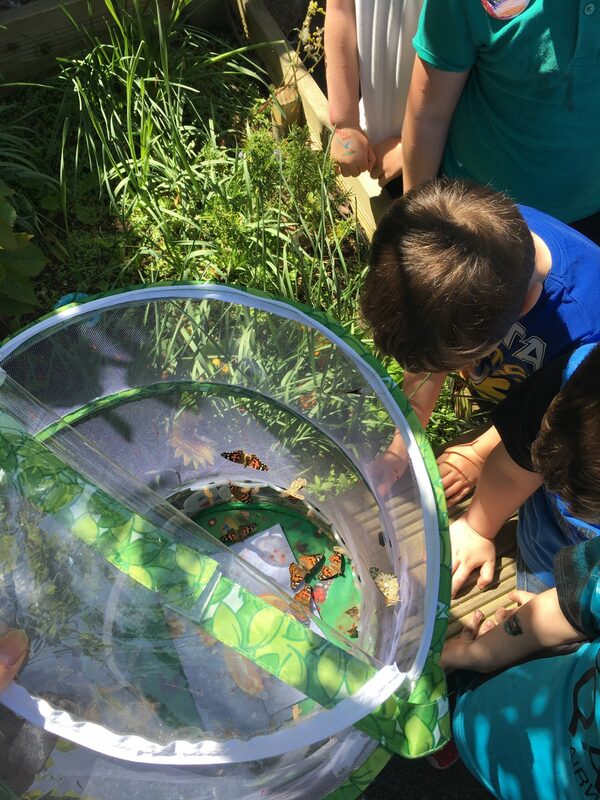 Last week our chrysalis turned into butterflies, as it has been so warm lately it happened a lot quicker than we expected. 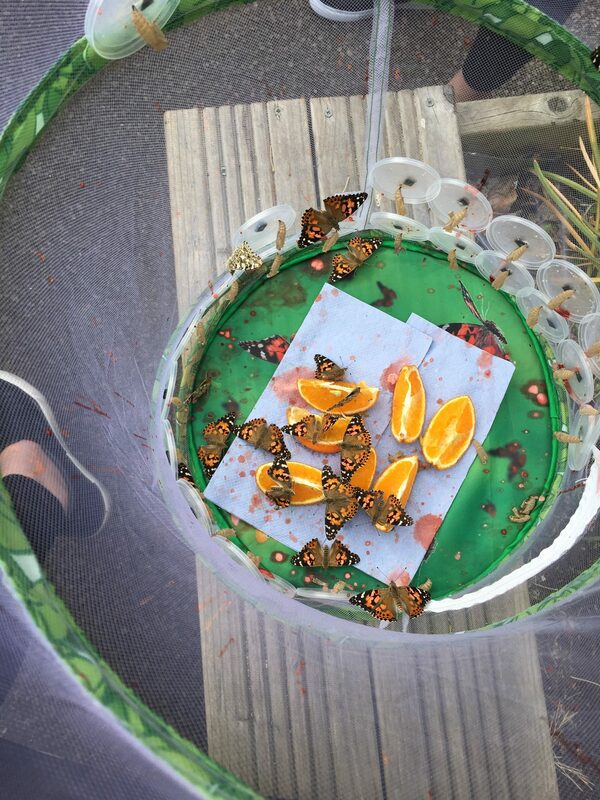 The boys and girls loved watching the butterflies in their net and were fascinated by how they drink the juice of the orange. 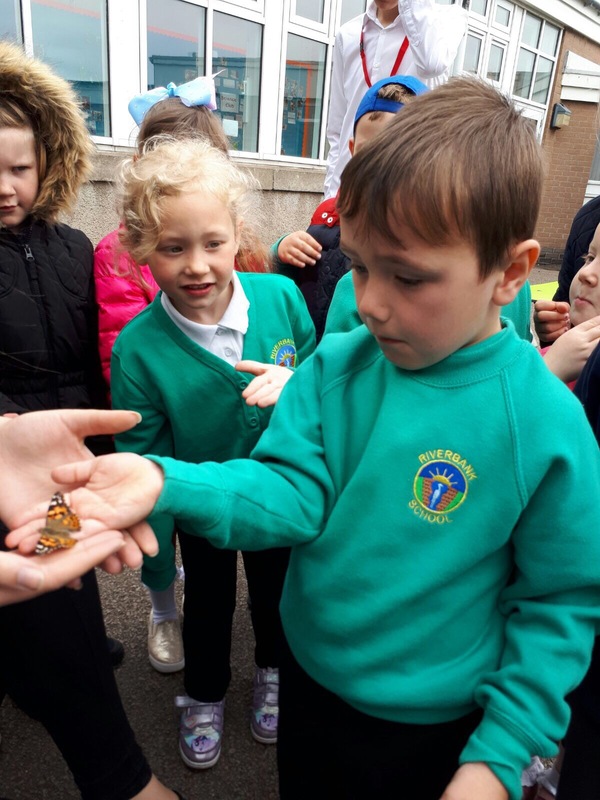 We had to release the butterflies over 3 days as some were already ready to leave on Friday while others were still in their chrysalis. We released the last of them yesterday and I thought I’d share some of the pictures from it. In P1B we have been looking at writing instructions. 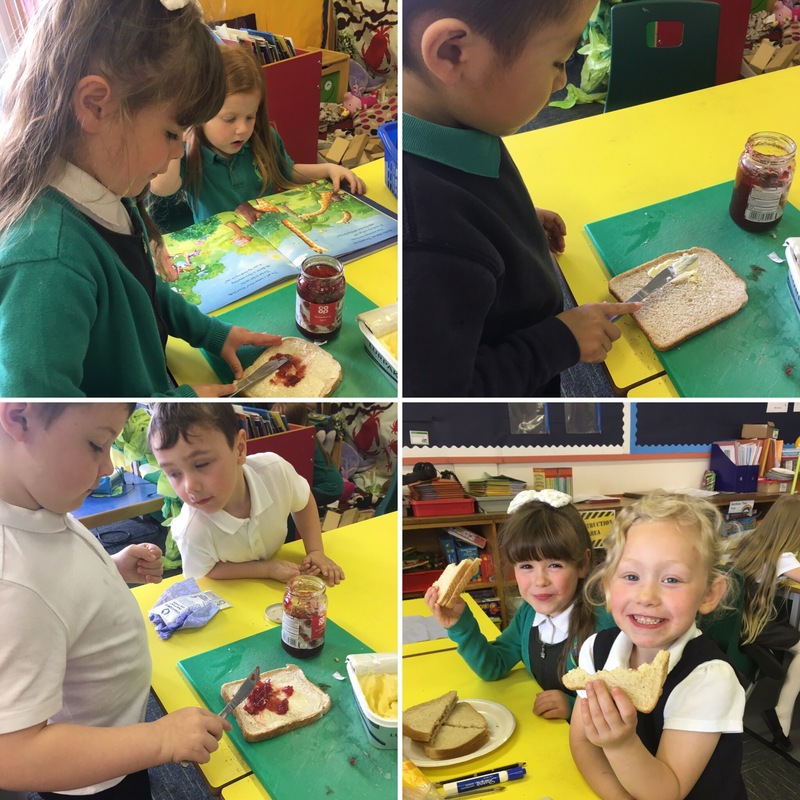 Last week we looked at how to plant a bean and this week we focused on making a jam sandwich. We even got to test our instructions out and see if they worked! The children did a super job and they loved making their own jam sandwiches. They remembered that it’s important to wash your hands before working with food to make sure we aren’t spreading germs. They did a super job of spreading the jam and butter. The jam was slightly more tricky but they soon got the hang of it. 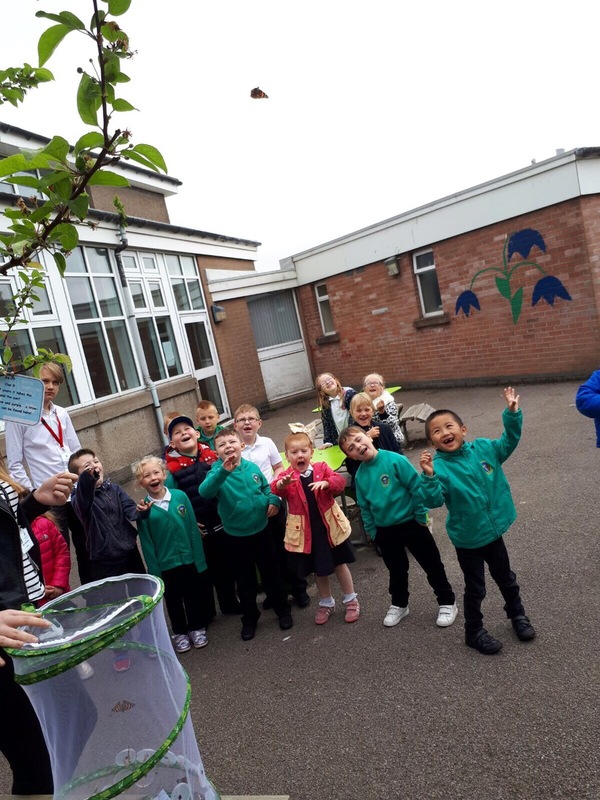 Last week our caterpillars arrived. 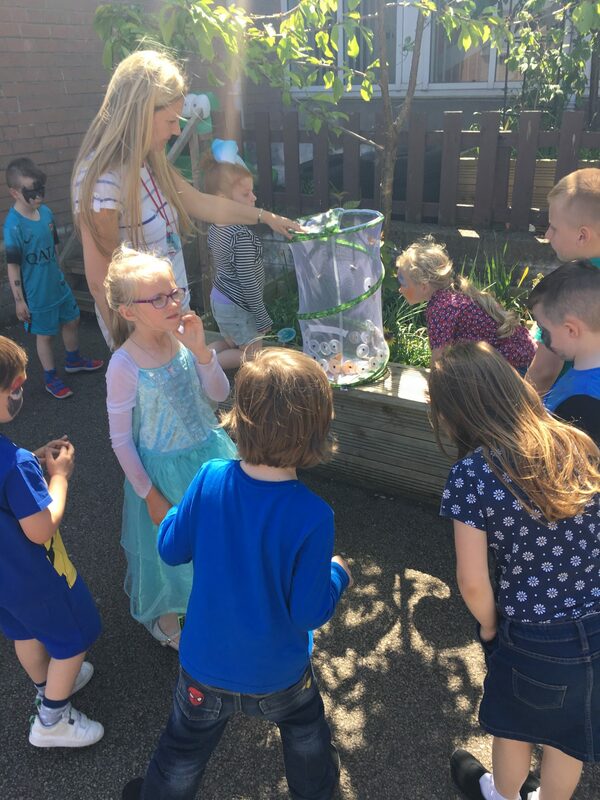 Each caterpillar has its own container with lots of food in it to eat to help it get ready to begin its change into a butterfly. Over the weekend they have all really grown and some have started to change colour, this shows us they are nearly ready to change into chrysalides. 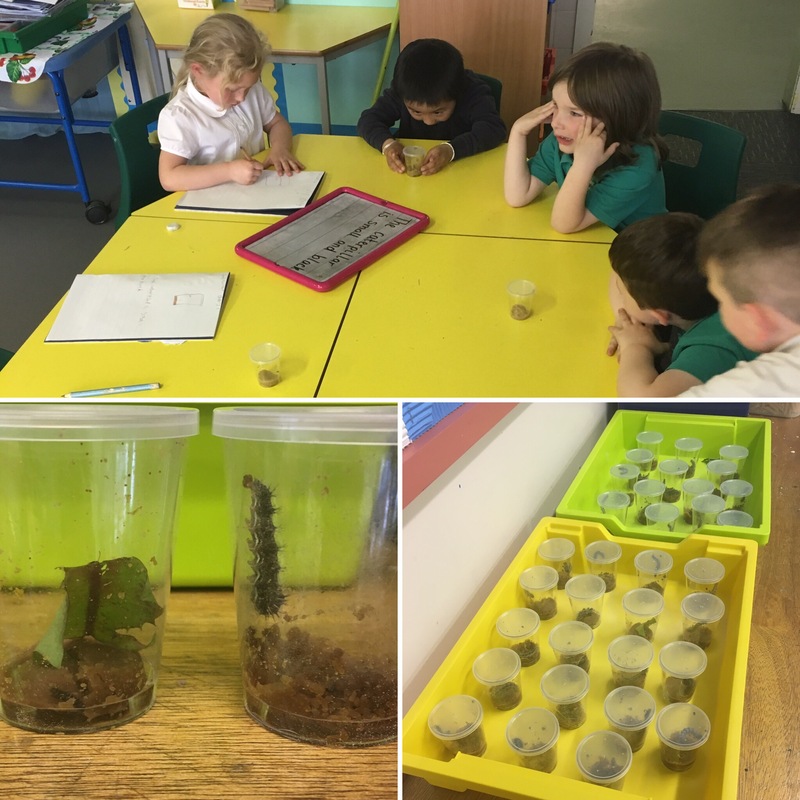 One caterpillar doesn’t seem to like his food very much and hasn’t really grown (left container) he helps us to see just how much the others have grown in a week. Can you spot the tiny caterpillar? Yesterday we went on a minibeast hunt. 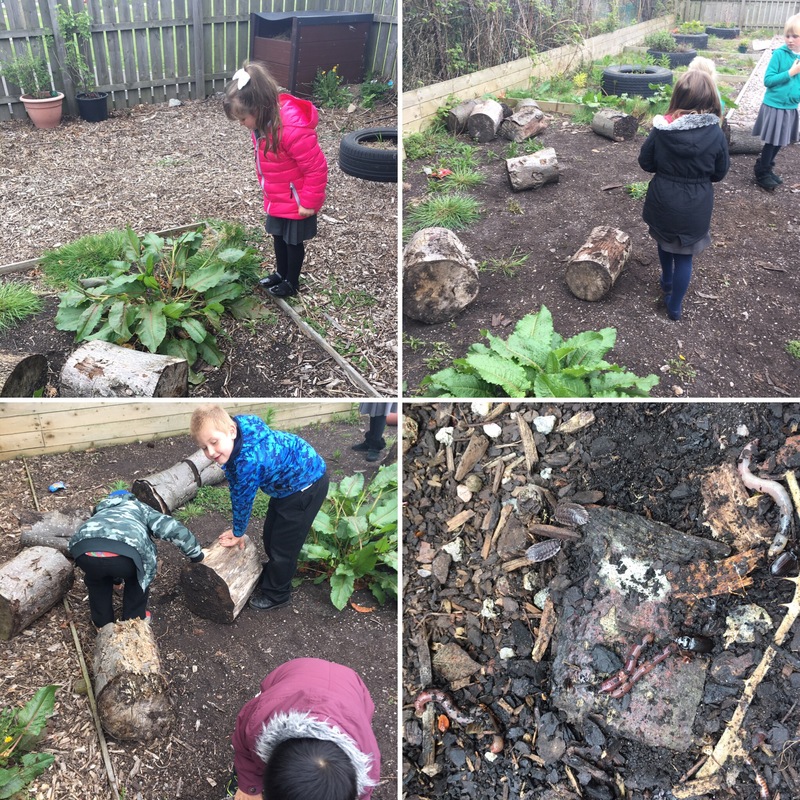 We looked in plants, in the mud and under logs to see what we could find. 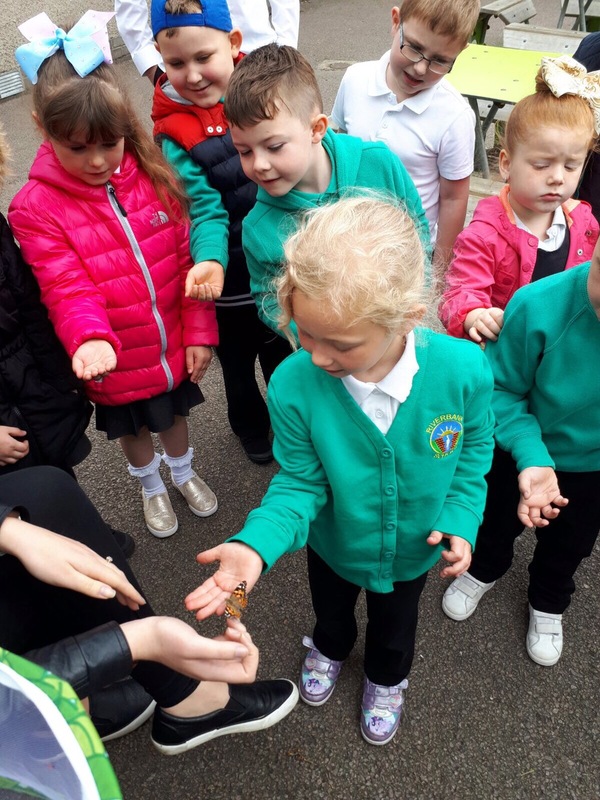 We found worms, woodlice, slugs, beetles and earwigs. We found some holes in leaves that looked like slugs of caterpillars had been eating them. We curefully put the logs back so they had there homes back. We’ve been learning how many legs insects have and categorising them! Technology to help our maths skills! I just wanted to do a quick post to make you aware of a new program we are using in maths. It is called RM Easimaths and we have been accessing it on the school iPads. 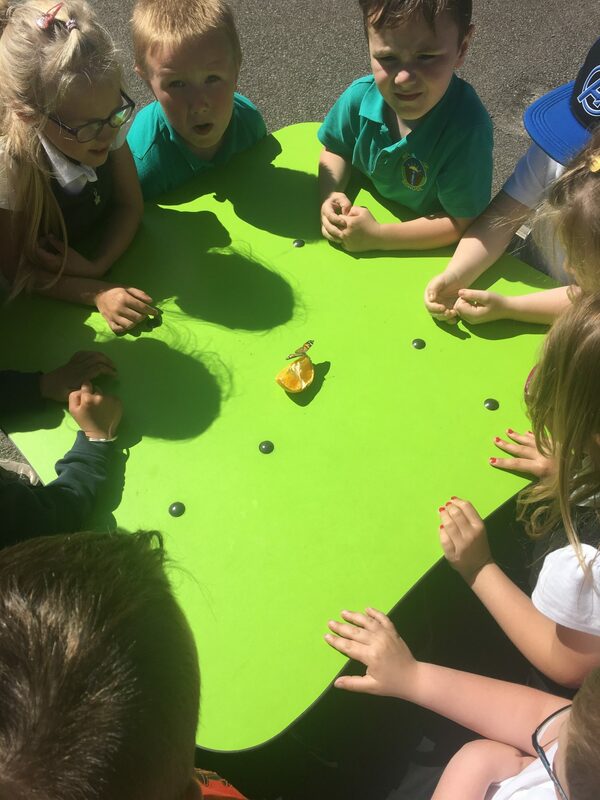 There are lots of little activities that are really fun and they actually help us to revise our maths skills. We love when it’s our groups turn to use the iPads, we sometimes forget we are learning! Yesterday we visited Tillydrone Library for the first time. The boys and girls remembered going in nursery and were great at walking there in their pairs. They had a great time looking through all the books and were fascinated by the dual language picture books! 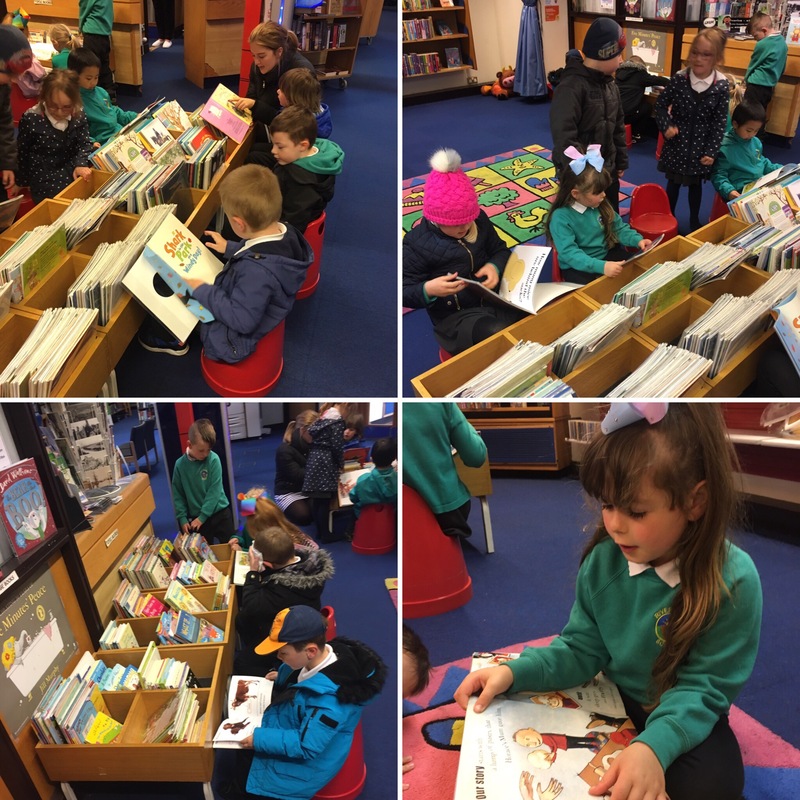 Everyone had a lovely time choosing a book and having a look through it. Some of the boys and girls were even able to read some of their books all by themselves. The librarian was very impressed by how sensible and well behaved we were! We will be visiting the library every other week this term. Once we get a set time slot it would be great to have a parent helper come along and join us! Our topic for the summer term is Plants and Animals. 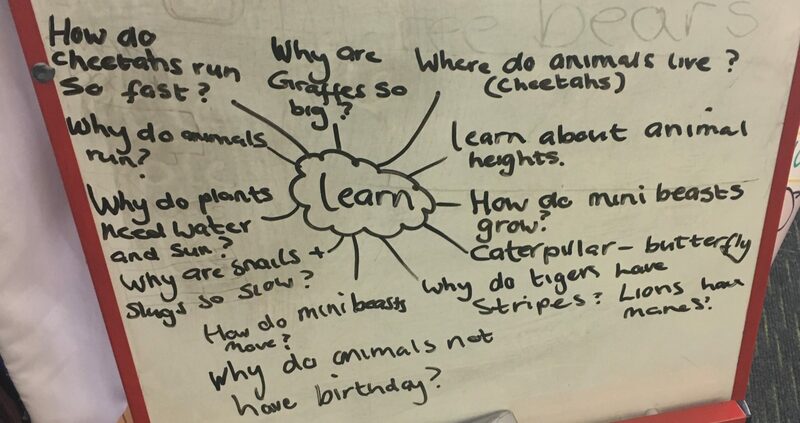 Just after the Easter holidays we sat down and thought about all the things we know about the topic and some questions we’d like to find the answer to. There were some really brilliant questions, I’ve included them for you to see for yourself. 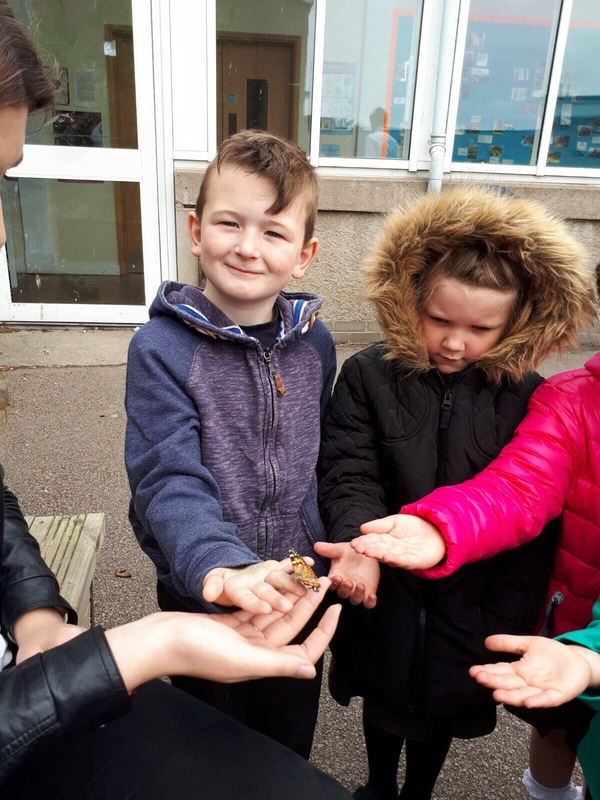 As part of this topic we will be learning about looking after plants and animals. 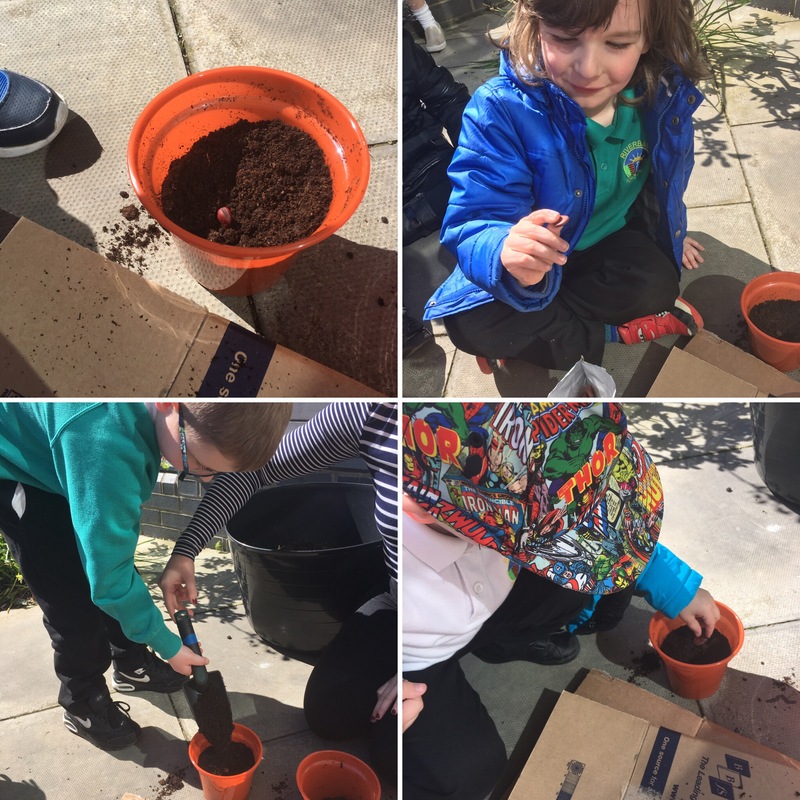 Yesterday we made the most of the lovely weather and planted our broad bean seeds. Hopefully we will soon have our own beanstalks just like Jack! The children will be learning what plants need to grow and they will be responsible for their own plant over the next few weeks. We loved planting our seeds today and everyone is very excited to watch them grow. We’ll keep you updated with their progress over the next couple of weeks! P1B have just completed the first two sections of their mini-maths topic on measure. 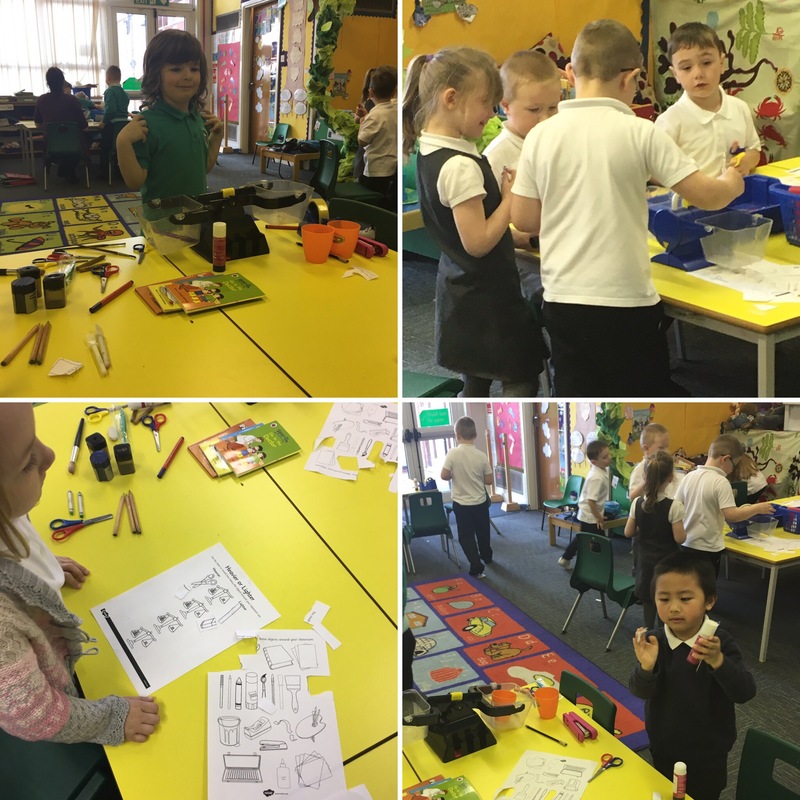 Before the Easter holidays they were investigating measuring length using non standard units of measure. This means instead of rulers and using cm or mm, we used our hands and cubes to investigate the length of classroom items. They did a fantastic job! 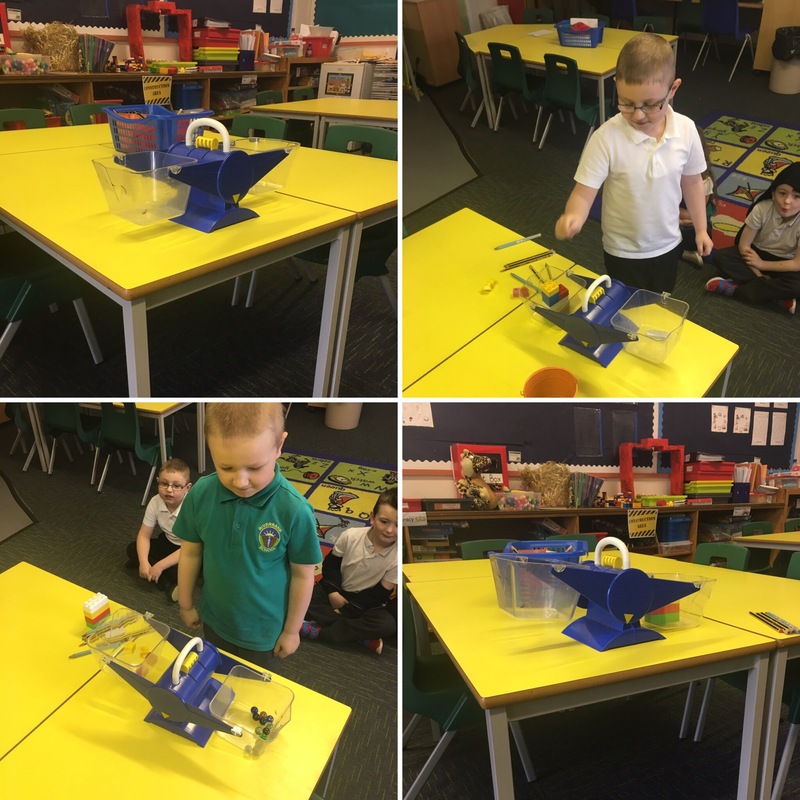 They have also investigated measuring the weight of different classroom items and finding out which is heavier or lighter. They have been using balancing scales to do this and have worked really hard with all their tasks. The only area left to investigate is capacity, this will involve lots of hands on investigating if how much water cups, bowls and jugs can hold. We’ll hopefully he to do this outside as the weather continues to improve.